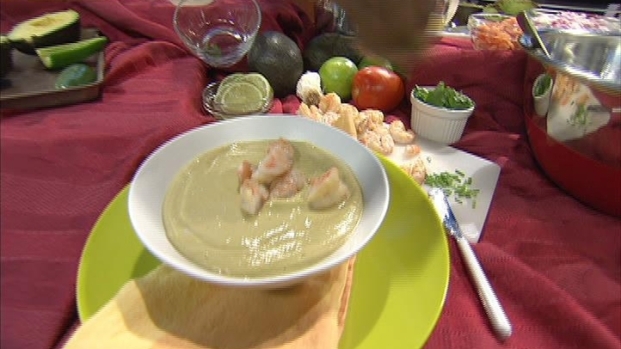 Summertime appetizers and first course dishes with chilled seafood, like this smoked avocado soup, are a flavorful addition to any menu and easy to make in ahead of time. Summertime is the perfect time for soups and appetizers that can be served cold or at room temperature. These dishes can be made in advance so that last minute preparation is minimized. Seafood that can be prepared ahead of time and then served cold, like salmon and shrimp, also adds a nice dimension to any recipe, too. The gazpacho below is an old favorite of mine and the smoked salmon bruschetta was sent to me by friends Pat Schmidt and Joey Chiappetta. Wayne shows you how to make chilled seafood dishes that will leave you with time to entertain your guests. Heat your smoker to 225 degrees F. If you are using a charcoal grill, preheat the grill with a small number coals pushed to one side for indirect method cooking/smoking. Add a small amount of hickory wood to the smoker. Slice the avocados and remove the seed. Brush the cut surface with a little lime juice. Place the shrimp in a small bowl and spoon about a tablespoon of lime juice on top and toss. Place avocados, jalapeño and shrimp on a baking sheet and put them in the smoker for 30 minutes or until shrimp is cooked through. Be sure not to overcook the shrimp. Remove from the smoker and allow to cool. Place shrimp in a covered bowl and refrigerate. Spoon the avocado from its skin and put it into a blender. Add jalapeño, remaining lime juice, cilantro, chicken stock, garlic, hot sauce and yogurt. Blend until spoon. Refrigerate for 2 hours or longer. Once chilled, taste for seasoning and add salt and pepper if you like. Pour individual servings of soup into bowls. Roughly chop the shrimp and add on top. Garnish with cilantro leaves, chives and a lime slice. Preheat oven to 350F. Slice baguette into thin 1/2" slices on an angle. Arrange on a baking sheet and bake until crisp, turning once, about 15-20 minutes. Remove from oven and allow to cool slightly. Rub each with the smashed garlic and set aside. Put salmon in a large bowl and add tomatoes, red onion, capers, dill and chives. Separately, whisk olive oil into red wine vinegar until fully emulsified. Pour over salmon mixture and toss to combine. Season with salt and pepper and set aside. Smear each baguette slice with a thin layer of cream cheese on one side and arrange on a serving platter. Top each slice with a spoonful of the salmon mixture. Add a sprig of dill and serve. This is my traditional gazpacho recipe. But, I've added about 3/4 pound of grilled shrimp to give it a little extra flavor and to give my guests more options. Cut 1 tomato into large chunks. Place tomato in a blender with 1 cup of V8 juice. Add 1/2 each of the cucumber, onion and green pepper. Add 1 jalapeño pepper and the roasted red pepper. Blend ingredients until smooth. Transfer to a large bowl. Add remaining V8 juice, olive oil, red wine vinegar, balsamic vinegar, Louisiana hot sauce, cumin, dill, chili powder, Worchestershire sauce, salt and pepper. Stir together ingredients, cover and refrigerate for 2 hours or longer. Meanwhile, mix all shrimp ingredients except zest together in a bowl. Cover and refrigerate for 30 minutes. Preheat your grill, if necessary. Separately, chop the remaining 1/2 each of cucumber, onion and green pepper and place in separate small bowls or serving dishes. Chop remaining jalapeño pepper and the small red pepper and place them in additional bowls or serving dishes. Place chives, sour cream and croutons in serving dishes as well. Grill shrimp until just cooked through. Be sure not to overcook. Remove from grill and transfer to another small serving bowl. Toss shrimp with lemon zest. Serve gazpacho in individual chilled bowls and allow your guest to add a few shrimp and any of the extras that they like.